We often get asked this question from our customers, clients, employees, and associates. If you are having trouble figuring out how to add your company logo into your Gmail signature, you are in very good company. Configuring your email account to automatically insert your corporate logo into the signature of each and every email correspondence is a tremendous way to boost the level of professionalism and brand name recognition of your communications. Of course, the first step is to create your logo if you haven’t already done so. Logaster.com provides a free resource online that provides quick and easy ways to create unique and innovative logo images. Once you have finalized your design, the following instructions provide a simple step-by-step method that can be used to automatically incorporate the image into your Gmail signature. For those of you who are using another type of email service provider, the steps will be very similar. But for now, we are going to focus strictly on Gmail for Google. Open up your Gmail Inbox. At the top right-hand corner, you will find a small gear shaped icon. When this is highlighted, a small drop-down menu will appear. One of the options is labeled “settings”. Click this tab in order to view the signature window that is located at the bottom of the screen. If you do not already have a signature created, perhaps including your name, address, and company name, then the “no signature” button will be highlighted. Most people will at minimum want to include their first and last name, company name, title, mailing address, and phone number into their Gmail signature. Other optional information might include Skype address, Facebook and other social media contact information, and fax numbers. You can experiment with the different types of fonts, colors, and highlighting options, as well. For example, you might want to type your name in “all caps” and in a bolder font. Gmail does not allow you to include your logo in the form of a static file, such as a PNG or a JPG, for example. We have to go through an extra step first. 3. Go to special website for image sharing. For example www.postimage.org (or any another website, e.g. flickr, dropbox, www.imm.io etc.). Now go back to your signature window in your Gmail account. Above this window, located approximately in the middle of the toolbar, you will see the “add an image” icon which looks like a small, gray mountain located within a square box. Click on this icon and insert the URL of your logo’s webpage into the designated area. A preview image will appear, allowing you to check the accuracy of the image. If everything looks acceptable, click “OK”. This is perhaps the most creative portion of the process. Now you get to play with different fonts, colors, and styles of the text in your contact information as it relates to your company logo. You can also determine where you would like to place the logo image itself. Most professionals prefer to have the logo placed directly below the contact information, but your options are limitless. For example, you might want to place the logo directly under your corporate title and immediately above the mailing address and phone number information. You can also adjust the font colors and styles of the contact information text to match those colors of your company logo. Or perhaps your company has a motto or slogan that you would like to place underneath. Other business owners will periodically change some of the wording below the logo according to specific product promotions or soon to be expiring sales offers. This last step allows you to link individual elements that are located within your email signature to outside websites, blogs, social media platforms, landing pages, or other online properties. 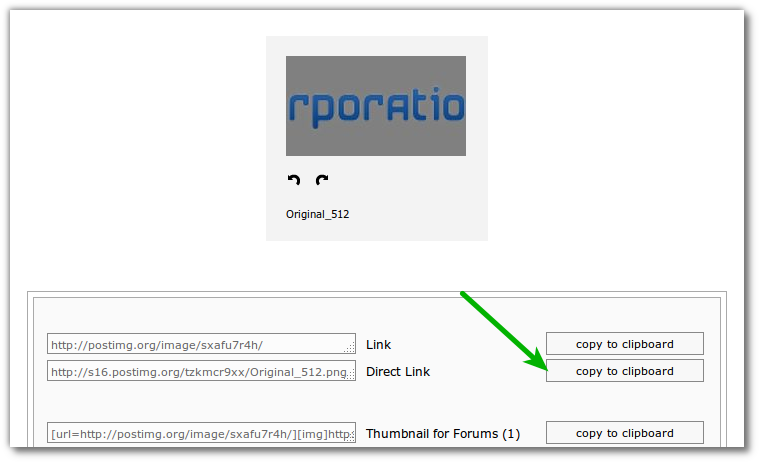 You can even assign a link to your specific logo image as well. For example, if you want to link your corporate website to the logo contained in your Gmail signature, simply highlight the image and select the “link tool” located within the toolbar of the signature window. This button looks like a little chain or a pair of eyeglasses. Similar to Step Three, another window will immediately display allowing you to insert the URL address of your company website, blog, or individual webpage. 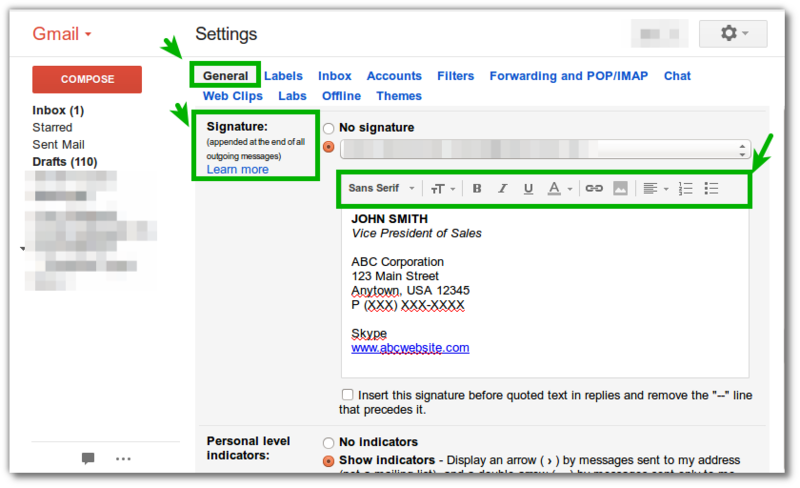 The same can be accomplished if you want to link individual text elements within your Gmail signature. Simply highlight the text, clicking on the same “link tool” and insert the appropriate URL address. For those of you who have also included an additional promotional offer description beneath your company logo, you might want to consider linking this text element to a specific landing page or purchase page that allows your readers to instantly take advantage of the offer. Once you have everything in place, complete with all of your links, colors, fonts, and logo images, it is always best to send out a test email just to be sure that everything is working properly. You might want to send one email to some other Gmail employee in your office while sending a second email to an outside friend or family member who has an address other than a Gmail account. This should cover all of your bases. Ask each person to review the logo, fonts, contact information, product offerings, colors, and links to make sure that everything is in proper working order. Each member of the company should have the same design of Gmail signature, rather than each individual person creating their own unique style. Therefore, this first attempt may very well become the professional template for the rest of the office. Consistency across the board for all Gmail signatures will make your business look more professional and competent. You will also look more like a solid team while also increasing your brand name recognition at the same time with email logo. Be open to suggestions as your other coworkers, managers, and supervisors critique the Gmail signature. The options are limitless, and there may be a great many ideas to consider. The final signature design should reflect the unique creative vision of your individual company. « Put logo creation wizard on your own website and earn money on it.